For one thing, it means the government could help the ag industry and the people it serves by standing back and letting farmers do what they do best: farm. Agricultural production has grown, thrived and contributed greatly to society for decades and strapping more paperwork, regulations and red tape on the backs of farmers won’t enhance the tremendous progress that has been made. Nor will it help Canadian farmers compete with American farmers and farmers in other countries. It also hints that the number of Canadian farmers – already in decline – may become even fewer. According to Statistics Canada, there were 193,492 farms counted across the country as part of the 2016 census, down almost 6% from the previous census in 2011. That’s a relatively modest decline, but one that continues a trend that dates back in the early 1940s. The largest five-year decline on record was from 1956 to 1961 when the number of farms fell by 16.4% or about 94,000 farms. It’s also interesting to note that in 2016, only 1 in 12 farm operations reported having a formal succession plan laying out how the operation will be transferred to the next generation of farmers. Of course, it must also be stated that while the number of farm operations has dwindled, the size of the remaining enterprises has increased through consolidation. Indeed, the size of the average Canadian farm in 2016 was 820 acres, up from 779 acres just five years earlier. Bureaucracy and red tape is only one challenge farmers face and only one factor, perhaps a small one, in the trend toward fewer farmers. But it’s an issue nonetheless and is top on the list of challenges that farmers tend to comment on. That said, no one should fear any resulting hit in production. The real difference down on the farm over the years has been in productivity. Better crop genetics, ever improving management techniques and precision farming have allowed fewer and fewer Canadian farmers to squeeze more and more production from each acre of land than ever before. And that’s despite weather vagaries, especially on the Canadian Prairies, that have ranged from a number of wet years, followed by overly dry conditions in key areas that past three years. 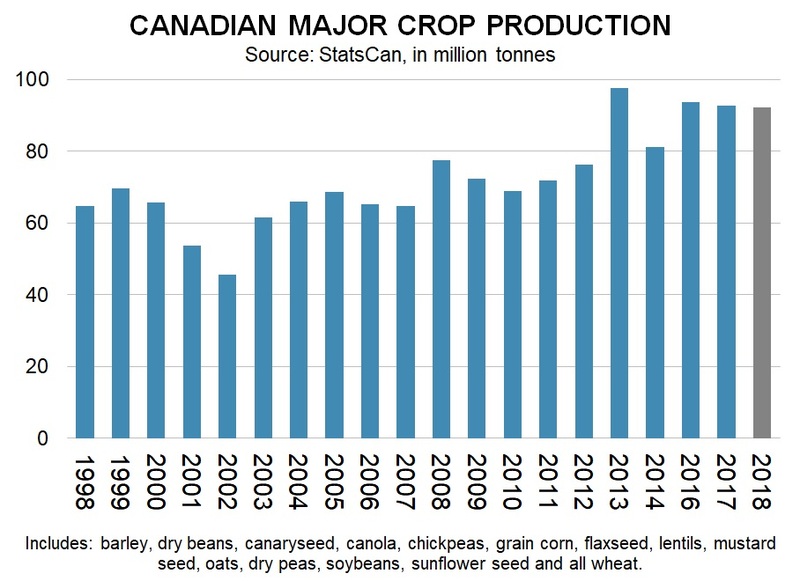 For 2018, the production of all field crops in Canada is estimated at 92.7 million tonnes, way up from 72.25 million in 2011 and an increase of nearly 40% from the 66.33 million tonnes produced in 2000. In short, productivity has increased by leaps and bounds despite the loss of farms and farmers. This isn’t meant to minimize the impact of the red tape burden faced by farmers today, or the potential for the younger generation to take a pass on taking over the farm – sometimes even at the behest of the older generation. Farming is a noble calling, and it’s a shame that some farmers apparently feel the hassle of government demands and forms has gotten to the point where it just isn’t worth it when it comes to handing down the homestead. Perhaps nothing has ever captured the farmer better than Paul Henry’s ‘So God Made a Farmer’ speech at the Future Farmers of America Convention in 1978. Parts of the speech were later used in a popular Super Bowl advertisement for Ram Trucks. That’s really what we’re giving up, not so much the production capacity, when we lose our farmers.